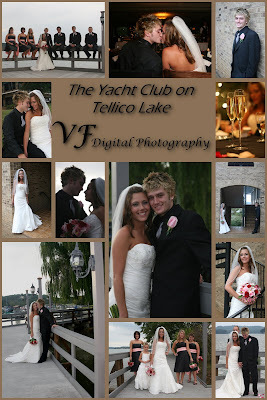 Jessica and Josh were married at the Yacht Club and Marina on Tellico Lake, and what another beautiful outdoor setting. It felt really nice to be on the water, they both were so very anxious to be married. Emotions were running high and the day although sprinkling a bit with rain, could not have been nicer. Deanna at the Yacht Club and Allison from LiveLaughLove weddings did a wonderful job coordinating the whole thing, very elegant! Again I felt so honored to be a part of thier special day. - Thank you.